According to CBS Sports, the sports website of America's most watched network, the Oilers are still in the playoff hunt. Er, so is Buffalo. And Toronto, Toronto's in the thick of things too. Hey, don't forget Arizona, they're also "still alive". Carolina too is really just a couple points away from the playoffs, their magic number is what, 40? Now the info is out of date. 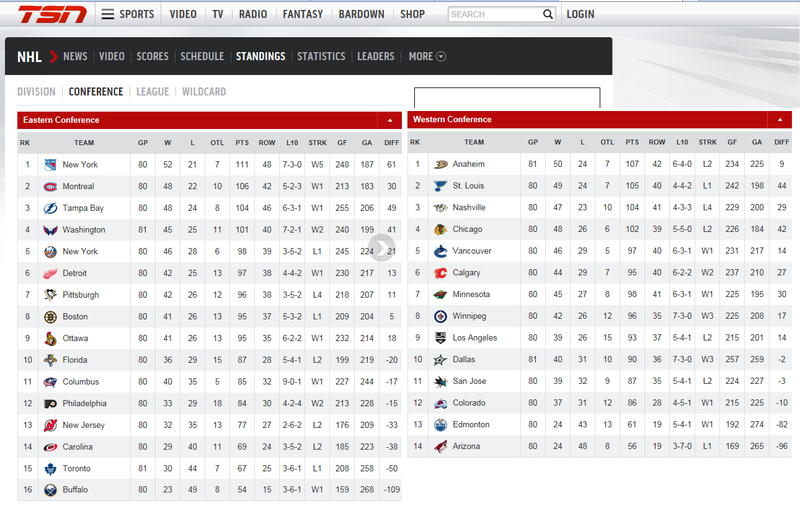 According to CBS Sports, teams like Winnipeg and Nashville had only played 79 games, which was true a couple days ago. That's one issue: America's most watched network doesn't update it's NHL coverage (though perhaps we should be happy that they at least give the scores for the games played last night). Columbus (eliminated from the playoffs) did beat Toronto (not eliminated from the playoffs) 5-0 on Wednesday April 8th. A quick scan seems to indicate that the games played, won, lost, etc. was accurate on the morning of April 7th. Only two days out of date, not bad CBS! But let's not nitpick about America's most watched network being 48 hours behind the times on the standings, that's trivial. 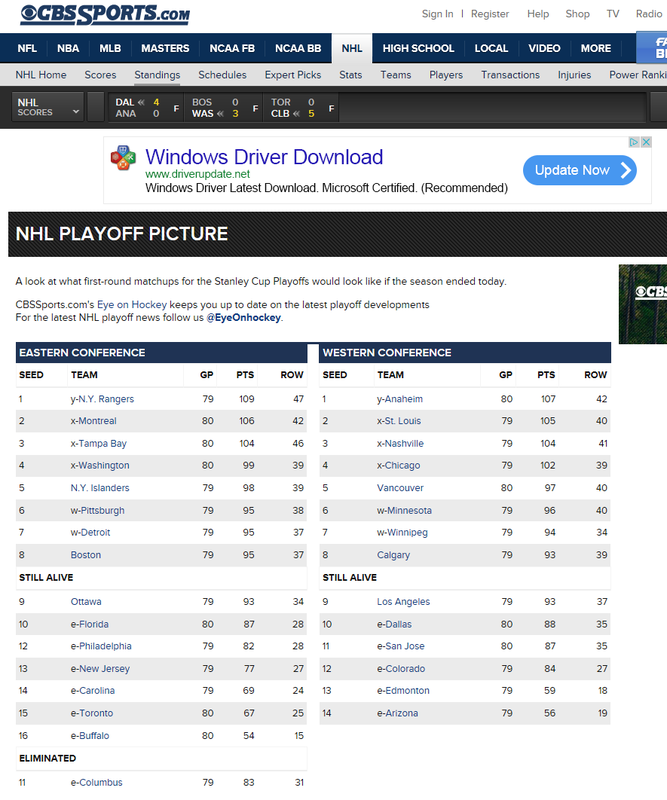 Instead, let's focus on the fact that CBS Sports, in their custom-made NHL standings page, completely gets who has been eliminated from the playoffs wrong. This is not trivial information. Who has been eliminated is a key question at this point in the season [or, for Oilers or Sabres fans, a complete month ago... -ed]. Not only are fans of the team interested in learning when their season fell apart, but fans of teams ahead of them in the standings nervously watch the teams below almost as intensely as they watch the teams above. Knowing that you need 4 points to catch up to Winnipeg is small consolation if you worry that Dallas needs 6 points to beat Winnipeg and you and has an easier schedule. Indeed, the whole reason I found this page this morning is that I was finding TSN's standings page inadequate for the specific reason that it wasn't telling me who had been mathematically eliminated. (Specifically, I was looking at the San Jose Sharks, who yes indeed were mathematically eliminated on Monday). This is important and interesting information, and it's more than a little shocking that major sports sites (and the NHL's own website) don't carry it. So how much worse is it to carry this and get it so horribly wrong? We can't even grumble "well, it's not up to date" or "they haven't added the most recent eliminations". They do have an elimination -- the Columbus Blue Jackets -- who with 83 points are indeed out of the playoff race.† So how do they figure that Buffalo (54 points) and Toronto (67 points) are "still alive" based on 83 points eliminating a team. These are all Eastern Conference teams, by the way, they're could even claim as they do with Arizona's 56 points or Edmonton's 59 that they could be "still alive". Columbus really seals the deal here: if they left them off the chart, we could look at the "e-" next to the teams to find who was actually eliminated. But honestly, how many of you saw right away that many teams had an "e-" for eliminated next to their names when there was a separate "Eliminated" section at the bottom? For the "latest NHL playoff news" you're implored to follow @EyeOnHockey on Twitter, who's likely to give you all the latest news, like "Chris Chelios leads the playoffs in +/-" or "Frank Mahovlich scored short-handed last night".